The location: The Movie Theatre. A. In Episode 24 (of season one), "The Proposal", in the scene where the kids try to cheer up Marissa by taking her to a sad movie. She has recently learned that her ex-boyfriend (Luke) is sleeping with her mother (Julie). They walk through the theatre lobby, then out onto the street. When they cross the street to get a Jamba Juice, they run right into Luke & Julie. A. It's a real movie theatre. The small shopping center right across the street (where the kids they went for Jamba Juice) was still open for business on my last visit to the area (although there is no Jamba Juice sold there). The Warner Grand is the obvious choice if a producer wants to shoot at a big movie theatre. It's one of the few old, single-screen theatres left, and the fact that its screenings are mostly on the weekend gives filmmakers plenty of weekday time to shoot in the theatre. As a result, the Warner Grand has been seen in several movies, including "Pearl Harbor". While Redondo and Hermosa are upscale beach communities, San Pedro is a somewhat rough harbor town, far removed from the genteel life of Newport Beach. The city is making an admirable effort to improve their harbor area, but right now I wouldn't really suggest that part of town at night for tourists, although a daytime visit to The Grand is usually safe. 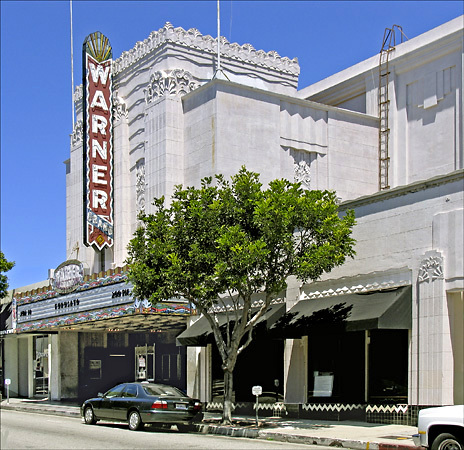 In fact, the Warner Grand offers historic walking tours of San Pedro (including the theatre) on selected Saturdays (reservations are required for the tours). Just a short walk from the Warner Grand is the intersection where Luke had his bad traffic accident in the same Episode 24 (of season one), "The Proposal". A. I found The Warner Grand when I was researching a page on "Pearl Harbor" for my Seeing-Stars website, so I recognized it as soon as I saw it on the show.